A 16 card set printed on heavy double-sided glossy card stock. Your favorite Luft Art pictures are on the front, and the back side has a table of information and a 3-view drawing. The sample card above does not do justice to the finished product. All cards are numbered and come in a plastic hinged case to keep the cards safe and in excellent condition. This card set is Series 1 - which means more will follow if these are successful. And as an added bonus, one card in the set will show a beautiful piece of Luft Art that has never been seen before! Please be sure to change the quantity on the order form if buying more than 1 card set. To pay by check or Money Order, please send an email to djohnson138@cox.net for details. Volume Sales: Please email Dan Johnson at djohnson138@cox.net for shipping rates and payment methods for volume sales. Modeling Madness says : "Now here is something really interesting and a great idea. 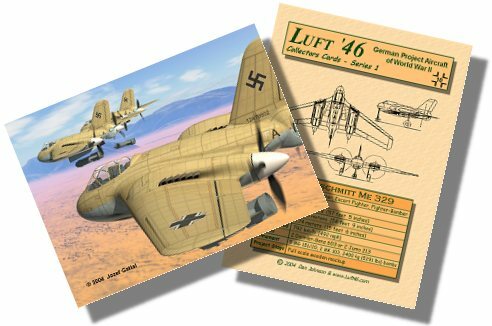 Luft '46 Collector's Cards. The folks at Luft '46 have come up with a neat set of superbly printed cards" The entire review can be read here . "Just received a few of the sets of limited edition cards from Luft '46. Awesome job! I was expecting them to be nice but was really impressed. This is not a commercial for Dan or anything. They come in a clear plastic clipped boxes and the art looks very impressive and the back of the cards have description, data and a three-view, which is small but shows a lot of detail.